Because of the many possibilities for endodontically restoring the posterior teeth and the high prevalence of restoration failures, this topic continues to be of major concern. A composite resin (CR) restoration reinforced by a horizontal fiberglass post may improve the fracture resistance of endodontically treated teeth. The authors investigated this possibility by comparing the fracture resistance of molars restored with direct techniques with that of molars restored with indirect techniques. The authors divided 50 extracted sound third molars into 5 groups: sound teeth, onlay (ON), inlay (IN), direct CR, and transfixed fiberglass post (TFP) plus direct CR. The authors performed standardized mesioocclusodistal cavity preparations and endodontic treatments. The authors cemented indirect restorations of Lava Ultimate (3M ESPE) adhesively in the ON and IN groups. The authors restored CR group teeth directly with Filtek Z230 XT (3M ESPE). In the TFP group, the authors transfixed 2 fiberglass posts horizontally and restored the teeth directly with CR. Thereafter, the authors submitted the teeth to cyclic fatigue loading with 500,000 cycles at 200 newtons. The authors tested fracture resistance in newtons in a universal testing machine. The authors analyzed data with 1-way analysis of variance and a Tukey test (P < .05). The authors of this study evaluated the effects of lasers on the outcome of direct pulp capping by means of a meta-analysis. The authors completed a literature search on PubMed, Cochrane Library, Embase, and China National Knowledge Infrastructure, as well as a manual search of the reference lists of all identified articles since the introduction of lasers in endodontics in 1971 through May 30, 2016. The authors systematically evaluated the studies that met the inclusion criteria and performed a meta-analysis. The authors studied the effects of nonnutritive sucking behavior (NNSB) on malocclusions through a systematic review of association (etiology). The authors performed a 3-step search strategy, including electronic searches. Studies of healthy participants with a history of active or previous NNSB, for whom specific malocclusion outcomes had been assessed, were eligible for inclusion. The authors considered before-and-after studies, prospective and retrospective (longitudinal) studies, case-control studies, and analytical cross-sectional studies. They excluded reviews, text and opinion-based articles, conference abstracts, case reports, case-series, and descriptive cross-sectional studies. The authors, using standardized instruments, independently assessed methodological quality and extracted data from the included studies. In situations for which there were sufficient studies, the authors conducted meta-analyses using the random-effects model, supplemented with the fixed-effects model in situations for which statistical heterogeneity was less than 50%, which the authors assessed using the I2 statistic. 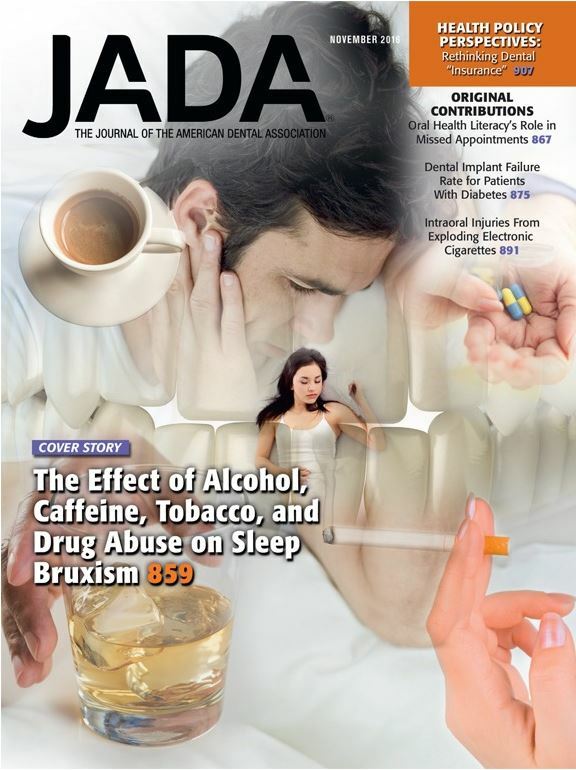 The aim of this systematic review was to answer the focused question, “In adults, is there any association between sleep bruxism (SB) and alcohol, caffeine, tobacco, or drug abuse?” This systematic review included studies in which the investigators assessed SB diagnosis by using questionnaires, clinical assessment, or polysomnography and evaluated its association with alcohol, caffeine, tobacco, or drug abuse. The authors graded SB as possible, probable, or definitive. The authors developed specific search strategies for Latin American and Caribbean Health Sciences Literature, PsycINFO, PubMed, ScienceDirect, and Web of Science. The authors searched the gray literature by using Google Scholar and Pro-Quest. The authors evaluated the methodological quality of the included studies by using the Meta-Analysis of Statistics Assessment and Review Instrument. Owing to limited evidence, it is unclear whether diabetes that is not well controlled would lead to a higher rate of dental implant failure. The authors of this meta-analysis evaluated whether the failure rate for patients with diabetes that was not well controlled was higher than the failure rate for patients with well-controlled diabetes. The authors searched PubMed, the Cochrane Library, and ClinicalTrials.gov without limitations for studies whose investigators compared the dental implant failure rates between patients with well-controlled diabetes and diabetes that was not well controlled. The authors pooled the relative risk (RR) and 95% confidence interval (CI) values to estimate the relative effect of the glycemic level on dental implant failures. The authors used a subgroup analysis to identify the association between the implant failure rate and the stage at which the failure occurred. In this study, the author identified associations among demographic characteristics, dental risk factors, health-seeking behaviors, oral health literacy level, and failure to keep dental appointments. Methods. The author conducted an unmatched 1:2 case-control study at a university-based dental clinic from February through April 2015. The author used the Comprehensive Measure of Oral Health Knowledge questionnaire to record the oral health literacy of the respondents. The author obtained additional information about the various covariates using a questionnaire and checking the patients’ electronic medical records. 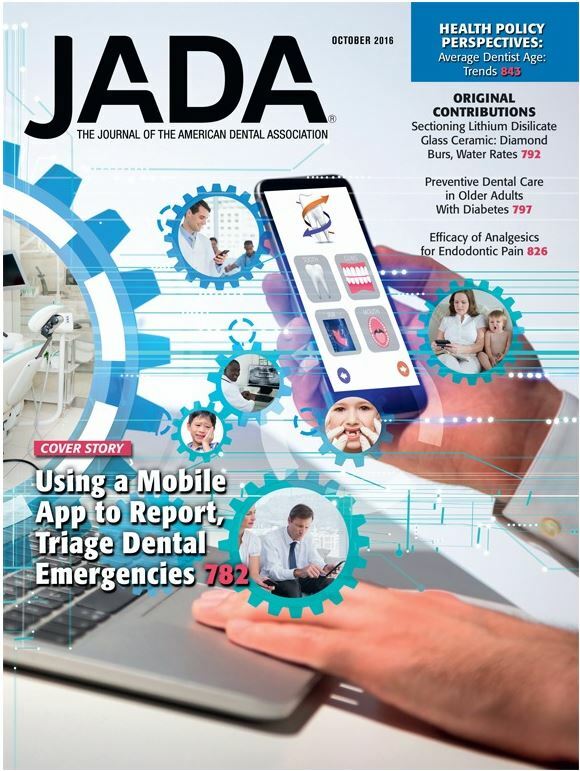 The author used a multivariate logistic regression analysis to test the associations between missed appointments and other risk factors in addition to oral health literacy. This study compared different diamond burs and different water flow rates on the cutting efficiency of sectioning through lithium disilicate glass ceramic. The authors used a standardized cutting regimen with 4 brands of diamond burs to section through lithium disilicate glass ceramic blocks. Twelve diamonds of each brand cut through the blocks in randomized order. In the first part of the study, the authors recorded sectioning rates in millimeters per minute for each diamond bur as a measure of cutting efficiency. In the second part of the study, the authors compared sectioning rates using only 1 brand of diamond bur, with 3 different water flow rates. The purpose of this investigation was to identify evidence-based clinical trials to aid dental clinicians in establishing the efficacy for recommending or prescribing analgesics for pain of endodontic origin. The authors prepared and registered a protocol on PROSPERO and conducted electronic searches in MEDLINE, Scopus, the Cochrane Library, and ClinicalTrials.gov. In addition, the authors manually searched the bibliographies of all relevant articles, the gray literature, and textbooks for randomized controlled trials. Two authors selected the relevant articles independently. There were no disagreements between the authors. The association between poor oral health and diabetes is well documented. Preventive oral health care is, therefore, strongly indicated for people with diabetes. The authors conducted a study to determine if there was a difference in preventive dental care use among older adults with diabetes in 2002 and in 2011 and to compare preventive dental care use by older adults with and without diabetes in 2002 and in 2011. The authors used a data sample of participants from the Medicare Current Beneficiary Survey that included older (65 years and older) fee-for-service Medicare beneficiaries. The key outcome was self-reported preventive dental care. In 2002, there were 8,725 participants; in 2011, there were 7,425 participants. The authors conducted χ2 and logistic regression analyses. In this study, the authors examined the prevalence and cost of care for children enrolled in Medicaid for potentially preventable dental conditions who receive surgical care in hospital operating rooms (ORs) or ambulatory surgery centers (ASCs). 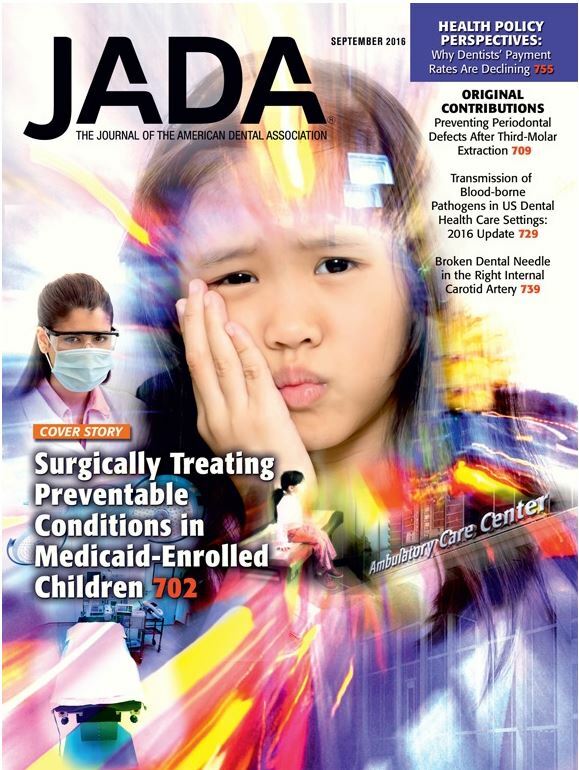 The authors analyzed Medicaid data from 8 states to find cases in which children aged 1 to 20 years received surgical care in ORs or ASCs in 2010 and 2011 for potentially preventable diagnoses, as defined with diagnostic codes.